Quoll (genus Dasyurus) are meat-eating marsupials native to Australia and Papua New Guinea. The name dasyurus means "hairy tail." Adults are between 25 and 75 cm long, with hairy tails about 20-35 cm long (about the size of a cat). Females have pouch to carry their babies. Quolls are threatened by eating toxic cane toads, but a University of Sydney project is teaching them not to eat them. 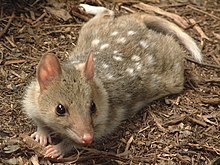 The family Dasyurini to which quolls belong also includes the Tasmanian devil, antechinuses, the kowari, and mulgaras. There is at least one fossil species from the Pliocene, that is D. dunmalli. Wikispecies has information on: Dasyurus. ↑ Serena, M.; Soderquist, T. (1995). "Western Quoll". In Strahan, Ronald. The Mammals of Australia. Reed Books. pp. 62–64. ↑ "Taste training for northern quolls". Australian Geographic. Retrieved 2010-04-15. ↑ Erica Rex (November 23, 2008). "Hope for Tasmanian devils, a decimated species". New York Times. Retrieved 2008-12-12. Another carnivorous marsupial indigenous to Tasmania, the quoll has a white-dotted reddish to dark chocolate brown coat and is about the size of a small house cat. This page was last changed on 18 July 2015, at 18:44.